Observation sites for additional deep drilling and penetration into Lake Vostok will probably not occur in the predictable future. It is illogical to spend money, time, and energy creating new ecologically unacceptable research stations (observatory sites) at the surface of Lake Vostok when there is a station already there (Vostok Station), as well as a stable hole nearly reaching the ice-lake boundary (Figure 11.5). Figure 11.5. Boreholes 5G and 5G-1 of Vostok Station (after Kudryashov et al., 2000): (a) inclination; (b) scheme of borehole. 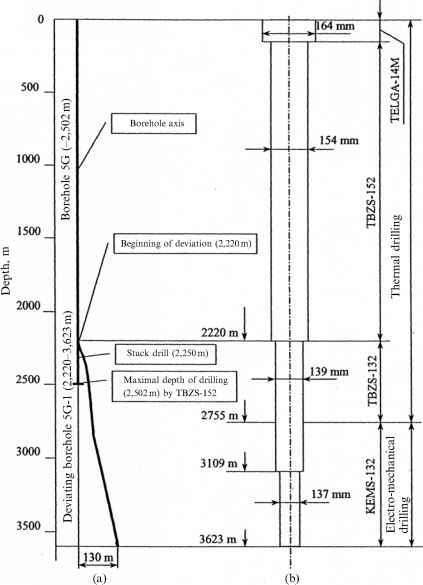 2,200 m depth (50 m above the lost drill) was made and hole 5G-1 was drilled with another 132-mm thermal drill to 2,755 m. The diameter was enlarged to 139 mm. Ice coring of deeper horizons was continued with an electro-mechanical drill to today's depth of 3,623 m (Kudryashov et al., 2000). The hole was filled with about 60 tons of drilling fluid to compensate for external pressure decreasing the diameter of the hole. For this purpose the density of aviation kerosene (the main component of drilling fluid) was increased by adding a densifier (Forane F-141b), resulting in a density of the fluid within the hole of 928 kgm~3. The level of the liquid in the hole is maintained at a depth of 95 m from the surface. In this case overburden pressure of the ice is slightly higher (0.1 Mpa) than the hydrostatic pressure of the liquid at the bottom of the hole, therefore, any connection between the lake water and the liquid in the hole will not contaminate the lake, and hole closure at the bottom will be small, according to calculations - less then 0.1mmyr_1. This means that the hole will be open and ready for operations for any national and international projects for an indefinite period of time. The advantages provided by the existence of Vostok Station and an existing deep borehole should be considered before money is spent on the design of new stations (observation sites) and boreholes. To achieve this level of information and co-operation, all scientists must learn to work together again in a similar fashion adopted for the International Geophysical Year (IGY) of 1957-1958 and after. 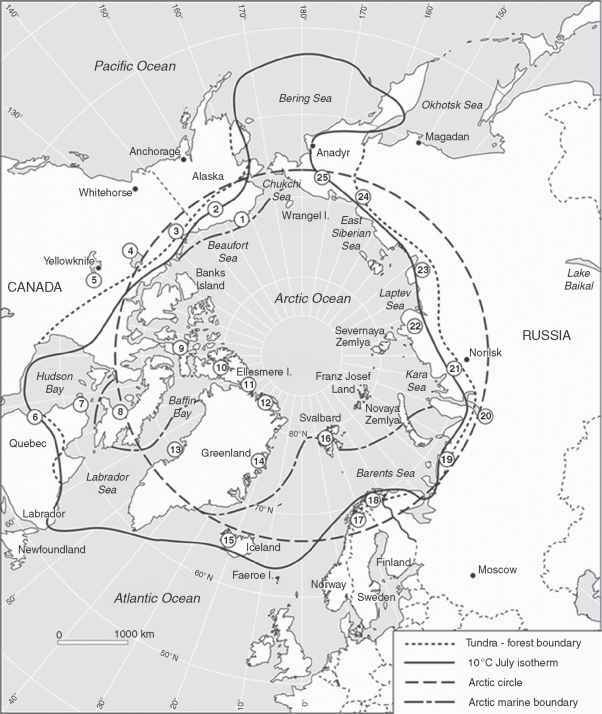 At that time, scientists of different nations working in Antarctica showed that combined team work was beneficial for all, and thus provided grounds for the Antarctic Treaty, despite the fact that two nations deeply involved in the study of Antarctica were ideologically divided by the Cold War (the U.S.A. and the Soviet Union). The Antarctic Treaty and its spirit served as an example for successful international cooperation that has extended to space exploration and succeeding treaties on space. However, regarding scientific studies of Lake Vostok and penetration of the lake, the earlier spirit of the Antarctic Treaty has partly disappeared. In a year a new scientific adventure will occur, the International Polar Year (IPY), which should provide the stimulus for a new generation of scientists willing to work cooperatively in Antarctica to study Lake Vostok. A related project is one that was developed by the Jet Propulsion Laboratory (NASA) for penetration into the subglacial sea of Europa, an ice-covered satellite of Jupiter (Chapter 1) (Carsey and Horvath, 1996). It was discussed at a JPL sponsored Earth-Europa workshop that was held at JPL on 28-29 October 1996. The workshop was devoted to the possibilities of comparable studies of some features of both Earth and Europa that have distinct similarities. Nature announced the discovery of Lake Vostok just 4 months prior to the workshop, and interesting similarities between conditions in Lake Vostok and a "subglacial" sea below the newly discovered ice crust of Europa were the center of attention. It was planned that devices, named "Cryobots" (Figure 11.6), would go from the ice surface of Europa to its "subglacial" sea, and from the surface of the Antarctic Ice Sheet to subglacial Lake Vostok, by melting-sublimating a cavern in the ice body and sinking its way to the water space below under gravity without maintaining a borehole in the ice behind them. Figure 11.6. Cryobot of NASA's Jet Propulsion Laboratory (U.S.A.), which should go from the ice surface of Europa to its "subglacial" sea, melting-sublimating a cavern in the ice body and sinking its way to the underlying water under gravity without maintaining a borehole in the ice behind it. In 1996 NASA also suggested this device for the study of the subglacial Lake Vostok (after Jet Propulsion Laboratory Project, 1996). (1) "Hot-melting drill head'' making a hole with a diameter of about 15 cm; (2) heat source modules; producing about 4kW; (3) hydrobot to study interior of the lake; (4) spool of cable, connected to the surface; and (5) the hole, which will be refrozen behind the cryobot. This would be possible because the cable connecting the cryobot with the surface would be spooled within the cryobot and would thus be unspooling while the device was sinking, similar to the Philberth probe described in Chapter 3. The energy requirement for melting ice through the Antarctic Ice Sheet to Lake Vostok is about 5kW for a vertical speed of about 1.5 m ah hour, with the energy to be transferred from the surface by cable. It was proposed in 1996 that the development and manufacture of a cryobot for Lake Vostok would be made through an award of the Office of Polar Programs of the National Science Foundation (U.S.A.). It was projected that the first tests of this kind of a device would be in deep ice in Antarctica or Greenland, but nearly 8 years passed without much production/man-ufacuring progress. Plans for a study of Europa propose that a cryobot should carry all the energy for penetration through the Europan ice cover, with the cable to the surface only being used for communication of information to the surface. In this case the "General Purpose Heat Source'' (GPHS) modules of the 16 cm diameter cryobot should carry about as much energy as, for example, is emitted from the burning of about 2,000 kg of kerosene, the amount of energy that can be placed and released in the space shown in Figure 11.6 by nuclear power only. Therefore, it is logical to conclude that nuclear powered reactors would be used for cryobots undertaking planetary exploration (Elliot et al., 2003). In relation to this, in 1963 Dr. Kapitsa and I proposed a Sub-glacial Autonomous Station (SGAS) for penetration of the Antarctic sheet to study the bottom water layer or a subglacial lake, if one existed. We suggested the use of a small nuclear power plant in the lower part of a hermetically closed container of the SGAS that would include various instruments and equipment. The nuclear power plant had to produce enough energy to melt to the bottom of the ice sheet. No hole was needed because the SGAS was supposed to descend in a water cavern melted by the unit, which would refreeze above it. Communication with the ice sheet surface would be kept by wireless communication. The Atomic Energy Institute of the U.S.S.R. Academy of Sciences approved the project. The Institute agreed to provide a small (diameter about 0.5 m) nuclear energy reactor of 100 kW, small enough to be installed in the SGAS's container, a cylinder with diameter 0.9 m. This power source would provide a calculated speed of vertical penetration through the ice of slightly more than 1 m hr-1. In other words the SGAS could reach the bottom of the Antarctic Ice Sheet below the Vostok Station area in less than 4 months. The device would be installed in a special hole at the surface of the ice sheet and the nuclear reactor would then be turned on. from a thermophysical point of view (sinking of containers of radioactive waste to the bottom of the ice sheet due to ice melting because of the nuclear energy dissipation of the waste (Zotikov, 1986)). Everything connected with radioactive waste disposal was classified at this time in the Soviet Union. I went to the very top of the Committee on Management of Nuclear Energy of the Soviet Union and showed my manuscript to the Vice Chairman of this Committee, Dr. Morochov, and we discussed many questions, including the SGAS return problem. In a few minutes he had a solution. The SGAS melts its way down because its weight is greater than the weight of the amount of water it displaces in the meltwater cavern. If, at the bottom of the ice sheet, its weight can be reduced to less than the weight of the water it displaces, then it will start to float in its water cavern. If we then place the heat generated by the nuclear reactor at its topmost surface, the device will start to melt its way up. It would not be a SGAS, but SGARS (Sub-glacial Autonomous Returnable Station) in this case. This idea had new interest in 1994 (Zotikov, 1993), after the first Cambridge workshop of 1993, when it became clear that a large subglacial lake below Vostok Station existed. The same Atomic Energy Institute (now Kurchatov's Institute) agreed on a suggestion of me to take part in designing a new, different type of unit. The Institute suggested it should be powered by a nuclear thermo-electric plant producing 0.5-2 MW of heat and 100 kW of electricity - capable of doing this for many years in an environment of the type of Lake Vostok (Figure 11.7). This project for a long-term study of Lake Vostok was presented at the second Cambridge workshop in 1995, but the attitude to the use of nuclear energy for a type of power plant in Antarctica has since changed, and it looks like the use of it in this case would meet opposition. I was told that Vostok Station is located at the sector of Antarctica that Australia claims as its territory. Australia prohibits the use of nuclear energy in its country, and we predict that Australia would be against this project in spite of the fact that all territorial claims in Antarctica are frozen by the Antarctic Treaty. The idea of the use of nuclear energy for melting through the ice sheet on other planets with the use of a cryobot design was suggested (French et al., 2001) in a project entitled "Palmer Quest: Searching for life below the ice caps of Mars'' (private commun., Dr. Cassidy, 2004). Palmer Quest is a major candidate for a NASA mission to the North Polar Cap of Mars in a search for extant life in a basal domain of the ice sheet. Figure 11.8 shows an image of the North Polar Cap of Mars with the general area of the proposed Palmer Quest landing site shown by an oval. It is believed that the North Polar Cap is formed from a mixture of ice and dust with a thickness of approximately 3 km spreading for hundreds of kilometers away from the Pole. The bottom of this ice cap is much warmer than its surface, just as in the Antarctic, but it was thought for a while that there is no melting and liquid water at the bottom of this ice cap, because of its insufficient thickness (Clifford, 1987). 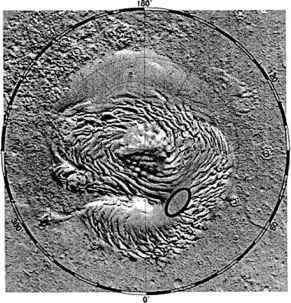 However, there are some features of the ice cap, found recently from a study of the Mars Orbiter Laser Altimeter (MOLA) data, which may be interpreted as an indication of catastrophic water outflow of subglacial water of the North Polar Cap (Fishbaugh and Head, 2002). Figure 11.7. Nuclear powered SOARS, which would be capable of going from the surface of the Antarctic Ice Sheet to subglacial Lake Vostok, melting a water cavern in the ice body and sinking its way to the lake, staying there for years and returning to the surface floating in a cavern of meltwater. The author presented this concept at the 2nd Cambridge Workshop on Lake Vostok (after the drawing by Russian Scientific Center "Kurchatov's Institute"). (1) Lower thermal drill; (2) nuclear thermo-electrical unit; (3) commanding block; (4) scientific, navigation and communication equipment block; (5) device for monitoring/storing many years of information about lake bottom processes (water pressure, geothermal heat flow, biological, and other condition changes); (6) ballast compartment - filled with water to make the station sink, devoid of water to make the station surface with the aid of an upper thermal drill (7) for melting the upper part of the cavern. Figure 11.8. MOLA-derived image of the North Polar Cap of Mars (after Carsey, 2004, private commun.). The oval in the picture shows an area where the search for life in the ice is planned as a part of the Palmer Quest mission.